Sooooo often people ask whether Olive oil is safe to cook with since it provides a certain texture and feel compared to any other oil..
For a long time the nutrition community touted the health benefits of olive oil and its role in theMediterranean diet. But when information about the smoke point of various oils began to surface, EVOO got a bit of a bad rap. Deemed unfit for cooking due to a low smoke point that would turn the healthy fat into a smoky, stinky, free-radical-releasing mess when heated, olive oil was relegated to the salad bowl. Now, however, it's making a comeback as more is learned about the smoke points of various oils. According to a report published in the International Journal of Food Sciences and Nutrition, olive oil has a smoke point of about 468° Fahrenheit. Considering that the average cooktop heats to between 350° and 375° Fahrenheit, it looks like we are good to go with our favorite oil. 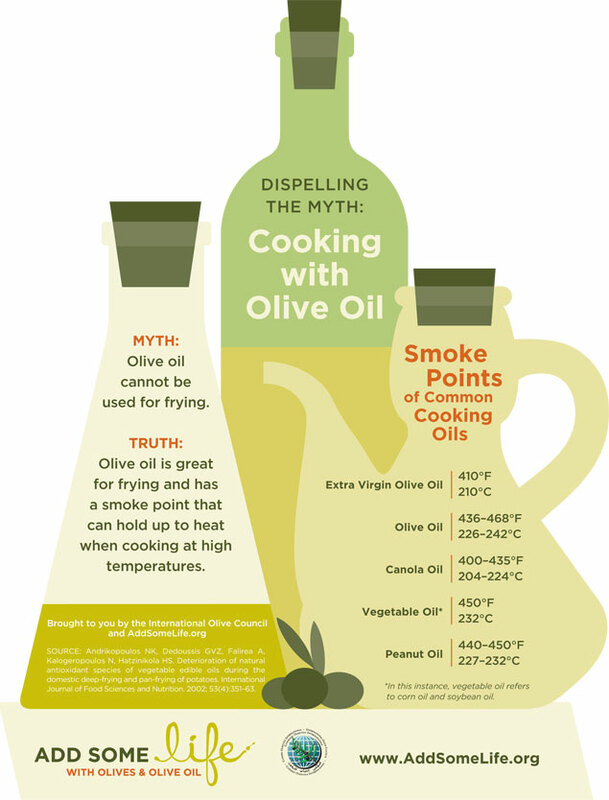 In fact, extra virgin olive oil can be heated to 410° Fahrenheit before smoking, so go ahead, sauté away. To see how other oils stack up, check out this handy infographic from the International Olive Council. Sure does dispel all the cooking oil myths out there!